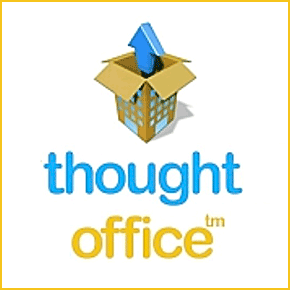 ThoughtOffice™ is the most advanced idea innovation software in the world. It helps you do three things very well. Best As a brainstorming partner, It provides thousands of very specific questions to help you “drill down” on a subject, the software provides ways to share your ideas that “make sense” to your audience. 1) As a brainstorming partner, it provides millions of “Thought Particles”: Fragments of ideas to help you explore creative directions and find lots of good ideas fast. 2) It provides thousands of very specific questions to help you “drill down” on a subject. Questions provided by PhD’s, MBA’s, CEO – leaders in the creative world. Ad Writers, Authors, Marketing Geniuses, Innovation Thought Leaders. You get instant access to some of the world’s brightest minds through the questions they ask when solving problems and creating their magic. 3) The software provides ways to share your ideas that “make sense” to your audience: Outlines, Storyboards, Blog posts. Branded with your name, logo – even a © Copyright notice block to ensure your ideas get the credit they deserve. ThoughtOffice is used by executives, coaches, students, Inc. 500 and Fortune 5,000 organizations to find opportunities, capitalize on their ideas, and solve seriously critical issues.